The Exchange 2007 and earlier versions had user mailboxes saved in storage groups. Hence it was possible to take backup of these user mailboxes by simply backing up these storage groups. 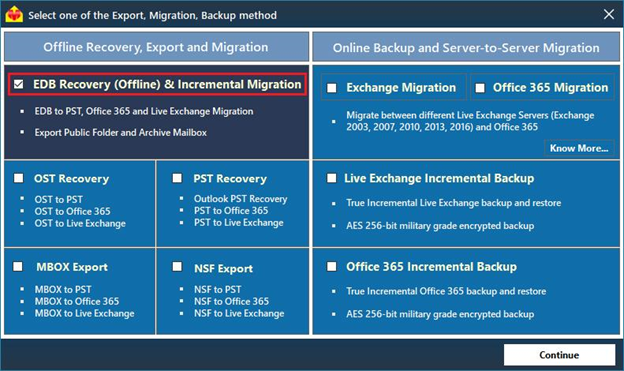 However, in the newer and more recent versions of Exchange Server, granular Exchange user mailbox backup has become a rather difficult task as user mailboxes are now stored in Exchange Database EDB file. To backup mailboxes in such scenarios, your best bet is to Convert EDB to PST. 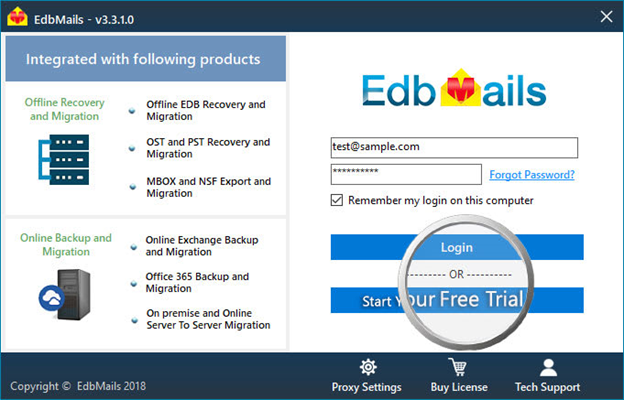 EdbMails for EDB to PST Converter is an free tool to convert online & offline corrupt and healthy EDB Files to PST, Live Exchange and Office 365. First let us look at what EDB and PST files are, then we’ll walk through some of the free methods that one can use to Convert EDB files to Outlook PST file. EDB – It is the Exchange database file that is used by Exchange Server to store all the information in the Exchange mailboxes such as email, calendar, notes, tasks, contacts etc. The EDB file makes use of a b-tree structure and the data is accessed using Microsoft’s ESE (Extensible Storage Engine). Dismounted EDB files cannot be opened directly. PST – PST or Personal Storage Table is a database used by Microsoft Outlook for storing data items such as mails, calendar, contacts and other such information associated with the Outlook user profile. The PST files can be opened in various Outlook versions and the contents within accessed easily. Why perform EDB to PST Conversion? Step 1: Download Exmerge from here and install. Step 2: Launch the ExMerge wizard and click Extract or Import (Two Step Procedure) and click Next. 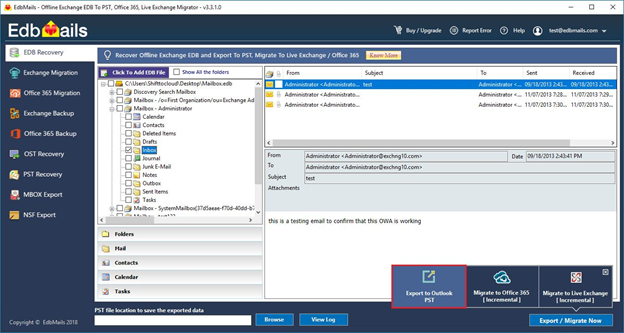 Step 3: Choose Extract data from an Exchange Server Mailbox and click Next. Step 4: Provide Exchange Server Credentials and click Next. Step 6: Select the mailboxes that you wish to export to Outlook PST file and click Next. Step 7: Provide the destination path for PST file in the next window and click Next to start the export operation. ExMerge Exchange 2003 larger than 2GB is not possible. You might get some errors like ExMerge exchmem.dll missing when trying to use ExMerge. Step 1: Log in to the Exchange Admin Center with your admin credentials. Step 2: Click on admin roles in permissions tab and go to Recipient Management, then click the ‘Edit’ button. Step 6: Select recipients and from the listed mailboxes, choose any mailbox that you want to export to PST and click the ••• button. From the dropdown, select Export to a PST file option. Step 7: The subsequent windows will allow you to select the mailbox to be exported as well as the path for exported PST file. You can also choose whether to send email to a mailbox once the .PST export operation is complete. Step 1: Use Get-MailboxStatistics to see the list of all mailboxes in a database. It can also be used to find out the size of the mailbox, number of messages contained within it as well as the last time it was accessed. 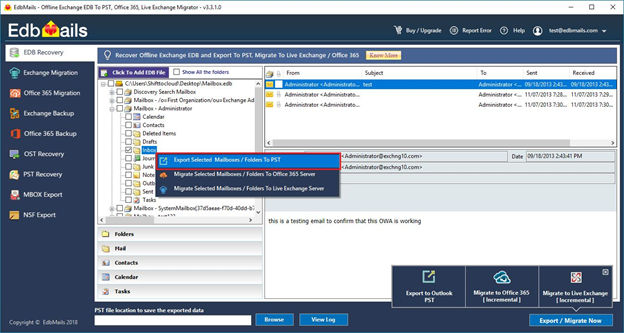 Step 2: Use the New-MailboxExportRequest cmdlet to export EDB file to PST archive. New-MailboxExportRequest -Mailbox Admin01 -FilePath "\\SERVER03\PSTArchives\Admin01.pst"
The three methods given above will help you perform manual EDB to PST Conversion for free. However as you must have noticed by now, these are quite time consuming and complex. Exchange admins with busy schedules will find it hard to manage these and hence will need an easier method. There are plenty of third party EDB to PST Converter solutions in the market but the best and most used amongst them is EdbMails. There are several contributing factors to the popularity of EdbMails but the most important ones are its intuitive user interface and forensic Exchange server recovery capabilities. All those who have had a chance to do EdbMails review thoroughly recommend it. EdbMails Exchange recovery software for Exchange EDB PST conversion has deep scanning algorithms that scan through your entire database file, no matter how corrupt it is and recover all mails, attachments, contacts, calendars etc without any data loss whatsoever. 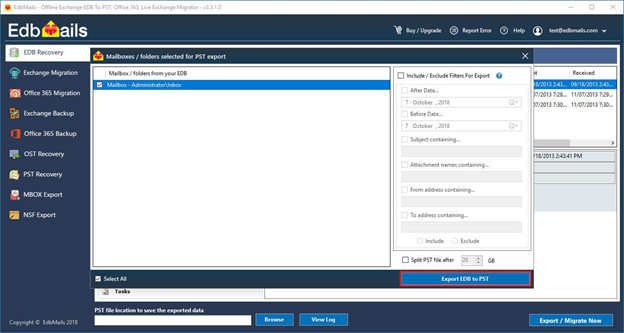 The EDB converter to PST will also let you selectively export items from the mailbox to Outlook PST file, making granular or brick level Exchange Recovery possible. 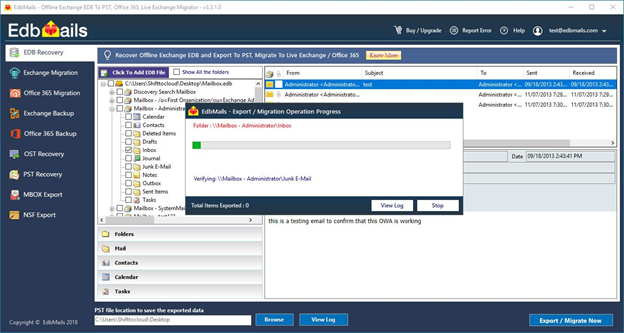 EdbMails is a complete solution, which means apart from Exchange EDB to PST recovery, it can also perform direct EDB to Office 365 and Live Exchange Migration. For direct EDB to PST conversions without any powershell cmdlets or other complexities, you can check out EdbMails EDB to PST Converter, it is used and recommended by thousands of IT admins across the globe. No matter how corrupt or inaccessible your offline EDB file is, EdbMails can seamlessly convert all its data such as mails, contacts, embedded attachments, calendar items etc to PST file. 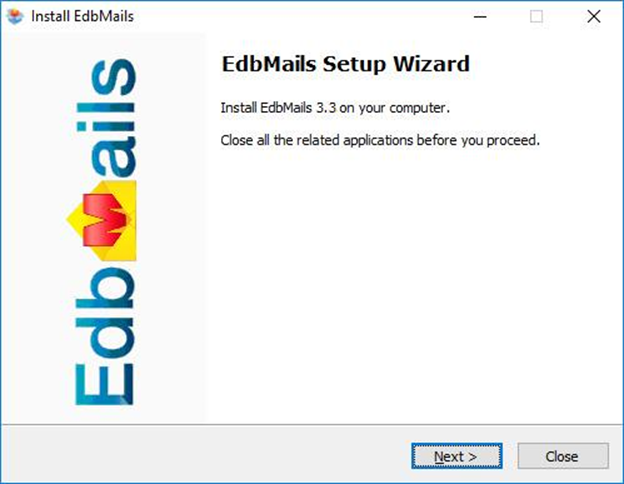 a. Download the EdbMails setup and install it on your computer where you have your Offline EDB file that you wish to recover. c. On the Welcome page, click “Next >” to proceed. And to complete the installation, follow the instructions that appear on the installation screens accordingly. a. Click the “Browse for EDB” button to navigate to where the EDB is located. If you are using Exchange 2003, EdbMails will automatically look for the corresponding STM file in the same location. If you are using Exchange 2007 or above, STM file is no longer used. b. Now click the “Continue” button to start the recovery operation. Step 4: Select the location to store the exported PST file by clicking the “Browse” button. a. Right click the Tree view and select the Mailbox / folder that you wish to export to a PST file. Choose the “Export Selected Mailboxes / Folders to PST” popup menu item to continue with the export operation. b. Click the “Export to Outlook PST” option to continue. e. Once the Export operation is completed, the message “Export operation has been completed.” will be prompted. You can now, open the exported PST file using Microsoft Outlook and verify the emails, Calendars, Contacts etc., items accordingly. 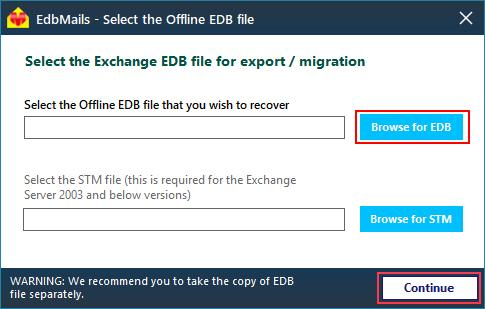 To export EDB to PST with EdbMails all you have to do is browse for and select the EDB file you wish to recover. Then recovery operation will begin immediately and you will be displayed with a preview of all the EDB contents. From here, you can select the required mailboxes that you wish export to PST. You can convert EDB to PST Exchange 2007 or EDB to PST Exchange 2010 with EdbMails.